You know those kids who happily eat (or, at least, TRY) any food that’s put before them? Well, unfortunately, none of them lives in my house. My children have never exactly been culinarily curious. I suppose I should have insisted like June Cleaver did on Leave It To Beaver when The Beav refused to try his Brussels sprouts. Mom & Dad made him stay at the table until he took a bite. Naturally, he grudgingly sampled one, loved it, and everyone rejoiced in the glow of Brussels sprout bliss. Often times I’ve felt like a short order cook – making one meal for my husband and me, and one for the kids (sometimes each child even got his own selection). This may sound like a lot of work, but for me it was just simpler to crank out the food so I could enjoy dinner without the wheedling, bribing, threats, and anger. There were, thankfully, a few meals that satisfied the entire family. It goes without saying that I prepared those frequently. 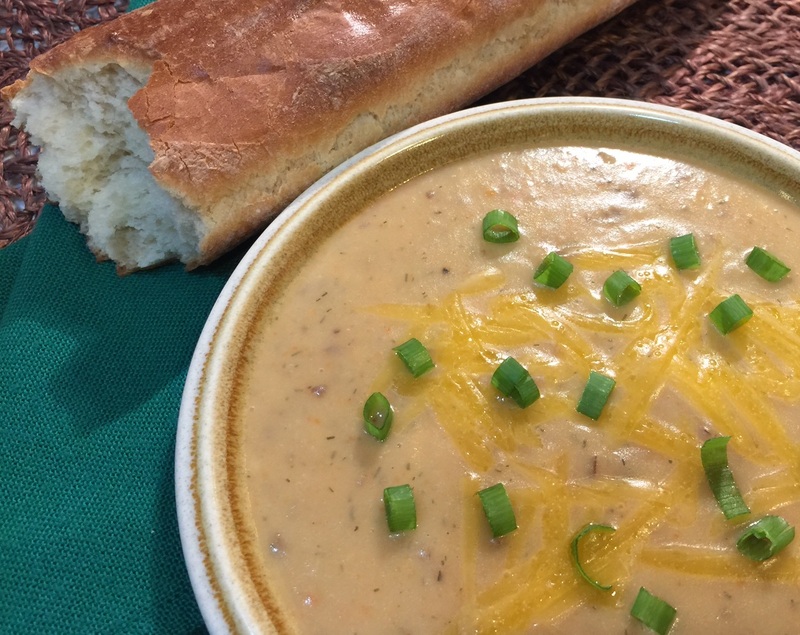 Potato Cheese Soup is high on the preferred list. Not only is it easy to prepare, but because it’s creamed in a blender (or food processor), you can add in a little spinach, etc., and the kids will never know. (We moms have to be a bit sneaky – it’s for their own good….they’ll thank us later.) Also, you can plop in broccoli or cauliflower – the soup is kind of like a cheese sauce. As noted, this recipe requires a blender or food processor. I haven’t nagged about owning one or both of these appliances in awhile, so with the after-holiday sales, I’ll suggest these items go on your purchase list, if you don’t already own them. Both are invaluable in the kitchen. I use my food processor and blender nearly everyday. Melt butter in a stockpot. Sauté onions and garlic over a medium flame for about 7 minutes, stirring often. Add in the potatoes and carrots, and continue to sauté another 10 minutes. Add in the stock, dill, salt, and pepper. Bring to a boil, then turn down flame to simmer the soup. Cover and cook until the vegetables are tender – test with a fork. Remove the lid and let cool about 10 minutes – you don’t want to put boiling liquid in your blender. Pour in milk. Purée the soup in a blender or food processor. You will probably have to do this in batches and, because of this, a second pot will be needed into which you empty the puréed batches. Melt in the shredded cheese over a low heat. Necessity Is The Mother Of Inventing CRAN-YAM MUFFINS! Although I’m generally not the most organized person around the house (open any closet or drawer in my home and you’ll know what I’m talking about), there is one area in which I do excel: I keep scrupulous records of holiday menus. Who attended, what was served and the quantity, if the amount was adequate, and how long things took to cook are all jotted down in my 3-ring binder. Every year after Thanksgiving dinner I write the same note – that very little cranberry sauce and yams were eaten, and NOT to make them again. And every year I get guilted into making them because “it’s tradition”. So post-Thanksgiving I had half a bag of cranberries and a yam unused. As you may know by now – I hate waste! Although I’m the self-proclaimed Queen of Freeze, I decided against freezing the cranberries – I knew they would get lost in the frigid abyss and I’d forget all about them. But what else could I do with cranberries? Pulling out my trusty Joy Of Cooking (a must-have for any kitchen! ), I looked up ‘cranberry’ in the glossary. 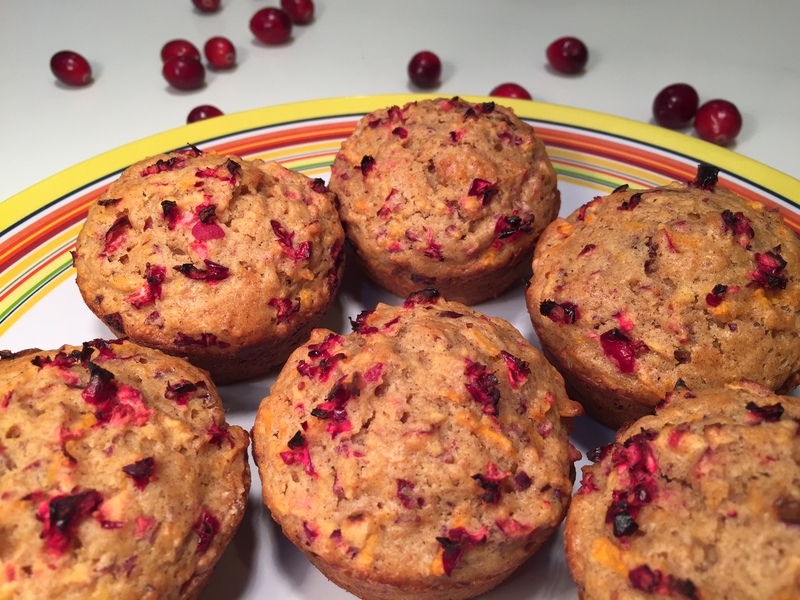 There they were: cranberry muffins. Yes! “What if I added shredded yam and spices to the muffins?” I pondered. Perfect!!! It took several batches to produce the look and flavor I’d envisioned. (And, yes, I actually had to buy more cranberries and yams. Oh, the irony!) But I’m now ready for future leftover cranberries and yams….even though I WON’T be making them next Thanksgiving. Really. NOTE: While paper liners for the muffin tin make life easier in the sense that you don’t have to grease the muffin cups (a job I kind of hate), I suggest you forego the liners for this recipe. The paper (and even foil liners) tend to stick to muffins, making it difficult to remove them without losing a good portion of the muffin. Again: hate waste! So bite the bullet and grease the cups. In a medium sized bowl put the flour, sugar, salt, baking powder, cinnamon, nutmeg, and ginger. Mix well with a large spoon. In another bowl (it can be a little smaller) beat the eggs well. Stir in the milk, 1½ cups of the cranberries, and the yams. Add in the melted butter and mix. Pour the liquid ingredients into the dry. Using the large spoon mix together, working with as FEW strokes as possible. Over mixing will yield tough muffins. It’s fine if there’s some flour not incorporated. The batter will be thick. Spoon the batter into the greased muffin cups, dividing the batter equally. Sprinkle the reserved ¼ cup of chopped cranberries on top. Bake at 400º F for about 23 minutes – the top will be starting to brown. Remove from oven and let cool in tin for 2 minutes. Run a dull knife around each muffin, lifting them up at the end of the circle to loosen. Remove to wire rack. Let cool at least 15 minutes before eating so they’ve had time to set, but are still warm. Delicious with a cold glass of milk, hot tea, or coffee. To reheat, toast in toaster-oven for 1-2 minutes. Mom’s Fudge! A Holiday Indulgence! When I was a child, every Christmas Eve my Aunt Judy and Uncle Don came over. My dad prepared his cheese fondue and my mother made her famous fudge. It’s widely accepted that my mother’s fudge is the best ever. In fact, about three weeks before Christmas, she and I (when I got old enough) would make mass quantities of her fudge and give platefuls away to everyone we knew. Friends, family, teachers, the postman, the paperboy – all rejoiced with this delectable gift. Now, when I say “my mother’s fudge”, I don’t mean my mother created the recipe. She was NOT an adventurous cook. But she did have the ability to find fabulous recipes that others developed. Fudge was at the top of her list. I wish I could credit the person who actually came up with this recipe, but all I know is mom found it in the newspaper. An interesting coincidence occurred in college. I was bragging to a friend about my mother making the best fudge. She bragged back that HER mother made the best. We compared recipes and they were identical. We discovered that our mothers clipped them out of the same newspaper! While this fudge recipe isn’t difficult, cooking the sugar liquid can be a little tricky. If you cook it at too high a temperature, the fudge will turn out hard. Follow the directions and you shouldn’t have any problems. BONUS: When you pour the molten fudge from the mixing bowl into the casserole dish to set, there’s always some remaining in the bowl. Those of you who follow my blog will know that I hate waste. So my family and I always have spoons ready to scoop all the dregs. (Every year I seem to leave more of the fudge behind.) Try it and you’ll completely understand! NOTE: This is not the time to try to reduce calories. Fudge is fattening! If you mess around with the ingredients, you’ll mess around with the consistency and taste. Put the chocolate chips, butter, walnuts, marshmallows, and vanilla into a large bowl. It needs to be ready to go when the syrup is done. Into a Dutch oven (large saucepan) put the sugar and evaporated milk. Turn the flame to low-medium and stir – preferably with a flat-headed stirrer – until the sugar is mixed in. Then turn the flame up a bit and stir continuously until it begins to boil. Turn the flame down slightly, keeping the liquid at a slow boil for 10 minutes, continuing to constantly stir. Adjust the flame as needed. NOTE: Rather than indicating a final temperature, the recipe directed the syrup to be cooked for 10 minutes. This isn’t a very accurate way to cook candy. So I measured the final temperature at the 10 minute mark when I made my last batch. It was 210º Fahrenheit. Use this as a guide. If your temperature is near 210º, you should be okay. If it’s a lot higher, you’ve cooked the syrup at too high a temperature. I’m not sure if cooling it before pouring it into the chocolate chips mixture will salvage it or not. A syrup too hot yields rock-hard fudge. When the 10 minutes are up, IMMEDIATELY pour the syrup into the chocolate chips mixture and begin to stir with a large spoon. You have to work fast. The goal is for the butter, marshmallows, and chocolate to melt and blend together. If you stir too slowly, the liquid will cool before everything can melt, and it will begin to set. When the last streak of marshmallow (that’s usually the last thing to melt) disappears, IMMEDIATELY pour into a 9½” x 13″ glass casserole dish. Working quickly, spread the fudge evenly. Let cool before covering, then refrigerate overnight. Now, grab your spoons and dig into the hot fudge that’s still clinging to the mixing bowl! Waste not, want not! It’s that time of year when we rack our brains trying to come up with gifts for our friends, loved ones, and conversely, for ourselves. NOTE: You won’t see a bread maker on my list. They’re expensive, bulky, heavy, and can only do one thing: make bread. The most difficult thing about making bread is kneading it – you can do that in a food processor. FOOD PROCESSOR – (Did you notice the nice segue way?) I love my Cuisinart, but there are many brands. It can be used to knead dough (bread, pizza, tortillas, pasta), chop vegetables (tomatoes, onions), purée (hummus, soup), shred vast quantities in seconds (carrots, cheese, cabbage), finely grind (graham crackers, nuts), and, I’m sure, other things for which I don’t need. I use mine almost daily! COOKIE SHEETS – You should have at least 2 flat sheets and 1 jelly-roll pan (it has 4 sides). I generally prefer to use my dark non-stick sheet – cookies cook a little faster, brown better, and I don’t have to grease the pan. But sometimes you don’t want any of that, so it’s good to have the silver kind, too. Don’t waste your money of the cushioned kind – it has a layer of air between 2 sheets. It’s not that they’re bad, it’s just that things don’t cook any better on it. Save your money. PIZZA WHEEL – This is not just for cutting pizza. I use mine for quickly slicing dough, such as when I make Corn Dogs. GARLIC PRESS – There are several different types. Make sure you get a sturdy one – these things have to undergo a lot of pressure. I use mine all the time. 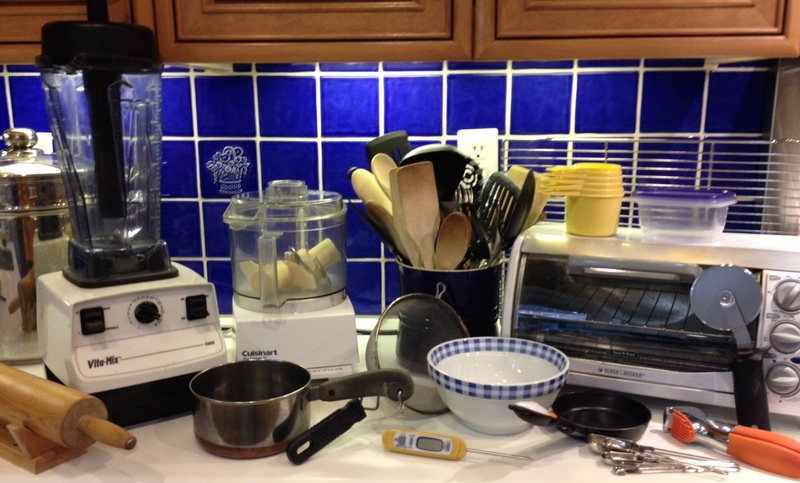 POTS AND PANS – This is an obvious need for a kitchen. It’s nice to have a variety of sizes. I use the 1 quart size the most and own 4. The 1½ qt., 2 qt., 3 qt., and Dutch ovens often come as sets and are worth the money. An ultra large stockpot is invaluable to me for making huge batches of spaghetti, chili, and vegetable stock so I can freeze it in portion sized containers for future use. I also love the tiny ½ cup and 1 cup sizes for melting butter. A 10″ skillet is a must for sautéing and making omelettes. Brands where the lids are see-through and have a steam escape hole are great. I also love handles that are metal, so they can go in the dishwasher. My black-handled Revere Ware pots are greyed and getting brittle after years of dishwasher cleaning. ELECTRIC FREE-STANDING MIXER – Absolutely essential for making cakes, cookies, frosting, whipped cream, and meringues. Don’t get a hand-held. Yes, they’re much cheaper, but you’ll never use it because when mixing you need one hand to scrape and one hand to turn the bowl. There are no hands left to hold the mixer. Plus, it gets heavy even after a short while. As to brand, I cringe when I see the price of KitchenAids. Outrageous! They’re not worth it. I’m still using the Sunbeam I’ve had my whole adult life. You don’t need a motor that powerful to beat cake batter. Sure, KitchenAids come with dough blades, but use your food processor for kneading dough. MIXING BOWLS – You can never have too many. A set of pretty nesting bowls are nice for presentation and usage. Add to that a variety of different sized glass bowls. It’s nice to have at least one huge bowl – it doesn’t get used that much, but comes in handy now and then. MEASURING CUPS – There are different cups for dry and wet ingredients. You’ll need both. Cups for dry ingredients come in nesting sets and are flat on top so you can level off the excess.. I have 4 sets and it’s the perfect number for me. Nothing is more frustrating than needing a ½ cup for sugar after you just used it for shortening. The best sets include ¼ cup, 1/3 cup, ½ cup, 2/3 cup, ¾ cup, and 1 cup. Measuring cups for wet ingredients have a handle and spout. You’ll need at least one of a 1 cup, 2 cup, 4 cup, and 8 cup. The larger ones should be plastic because they’re lighter and easier to manage. MEASURING SPOONS – You should have at least 2 sets. The best kind are metal and have the size etched into them. The paint eventually wears off the plastic ones making it hard to figure out the size. A set that includes 1/8 and 3/4 tsp, as well as the usual sizes is the best. LARGE WOODEN BREAD BOARD – Not only can this be used for rolling out dough, but you can cut fruits and veggies on them. I make so much dough that I keep a floured board in a large drawer I had specially made. Before that, I put brackets under my overhead cabinets so I could slide it in and out without throwing out the flour. PASTRY SHEET – These are great for rolling out pie crusts. Mine is Tupperware, but there may be other brands out there. To dispose of leftover flour, just lift up the sides and empty into the trash. The sheet folds up small and can be stored away easily. MUFFIN PANS – Cupcakes are very popular nowadays. I made the switch from whole cakes to cupcakes – they’re great for portion control. One cupcake = 1 serving. Done. Two pans are nice so you don’t have to cook in batches. LOAF PANS – These are great for baking bread, “meat”loaves, quick breads, and loaf cakes. They come in glass and metal. I really don’t have a preference. I own both and generally use the glass. POTATO PEELER – This is just a small item, but essential for peeling potatoes, yams, apples, and carrots. You don’t need an expensive one – the cheapies work well. GRATER – I use mine constantly for grating cheese, and occasionally for a small amount of shredded carrots. (I use the food processor when I need a larger amount.) Buy one that has small holes (for hard cheeses) and large holes (for soft cheeses). I don’t like the kind that have four sides and stand upright – I tend to cut myself with those. DEEP FREEZER – Okay, this is a large item but if you have room, I highly recommend them. Not only can you stock up on flours, frozen foods, and leftovers, you can cook multiple batches of foods that freeze well (such as spaghetti sauce and chili), and then freeze in portion sized containers. Cook and clean once, then eat for months to come. Just because you’re tired doesn’t mean you can’t have a home-cooked meal. STORAGE CONTAINERS – You can never have too many containers – everything from ¼ cup size up to giant cake holder size. SIEVES – These are necessary for draining. It’s nice to have a large, medium, and tiny size. WOODEN STIRRERS – Using wood prevents scratching up your pots and pans. You should have both spoons and flat stirrers, and at least two of each. The more expensive ones aren’t necessary – the cheap ones work fine. ROLLING PIN – Absolutely needed for rolling pie crusts, some cookies, and tortillas. They have marble ones, but I don’t like them. They’re heavy, expensive, and break if you drop them. The wooden ones work best. TOASTER OVEN – Rather than having a pop-up toaster, the toaster oven will do the job of making toast, plus a multitude of other tasks. I’ve never had much luck with baking in them, but I toast nuts, cook fake bacon, and make toasted open faced sandwiches in it. Mine is used nearly everyday. It’s better to use the toaster oven than heat up my big oven for small things. THERMOMETER – After years of using and breaking the glass candy thermometers, I finally bought a digital one. It’s fabulous. Mine adjusts for Celsius and Fahrenheit, which is nice. WIRE RACKS – You need at least one large one or two smaller ones. Baked goods need to be cooled on a rack to set properly. UTENSILS – You can never have too many spatulas, slotted spoons, tongs, wine bottle openers, etc. It’s a giant category – not very exciting but extremely necessary. And that’s my list! Repeat: MY LIST. I’m sure there are those of you out there who couldn’t live without your tortilla maker or mortar & pestle. We all have different wants and needs. But I guarantee, just about any item on this list would be welcomed by most people who actually use their kitchen for cooking. Happy shopping!